Getting an entire list of shortcut keys for Chromebooks has proven to be difficult… but here they are, as best as I know! Some of these may come in useful if you find your screen to be locked or shouting at like a crazy person. Others are just useful from a workflow perspective and can save you (and your students) tons of time. Ctrl + Shift + L will lock/unlock your Chromebook’s screen. Ctrl + Alt + Z will enable/disable ChromeVox (spoken feedback). Ctrl + Shift + Q will Log out of your Chromebook. Press this key combination twice to confirm. Ctrl + Alt + Z will toggle accessibility features on/off. Alt + Shift + S will open up the panel in lower right, same as clicking on time and your icon. This can be used to easily toggle accessibility options. Ctrl + Shift + Space will toggle keyboard types (only changes if more than one type is enabled). 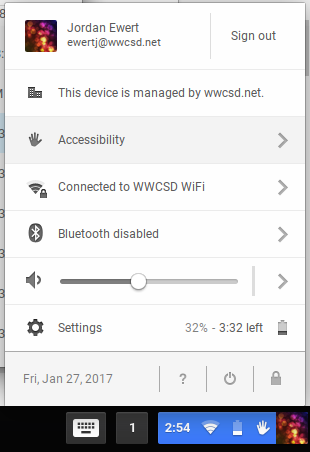 The keyboard settings can be changed by clicking on the gear icon (settings) in the lower right panel > Device section > Keyboard Settings. 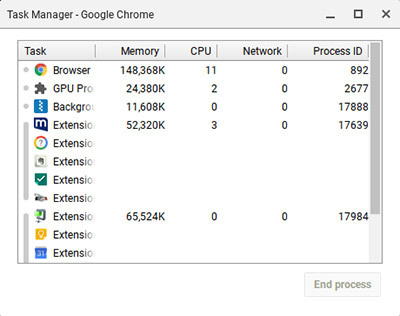 Shift + Esc Launches the Task Manager (useful if a program is frozen). Alt + [ Docks your window to the left side of your screen. Alt + ] Docks your window to the right side of your screen. Ctrl + Switcher/F5 — Take a screenshot and save it to your Downloads folder The Switcher key is located in place of the F5 key on a standard keyboard. Ctrl + Shift + Switcher/F5 Takes a screenshot of part of the screen. Use the cursor to select the part of the screen you want to save. Alt + Search Toggles Caps Lock. The Search key has a magnifying glass on it and is in place of the Caps Lock key on typical keyboards. Ctrl + Shift and + Increases screen scale, making items appear larger on your screen. Ctrl + Shift and – Decreases screen scale, making items appear smaller on your screen. Ctrl + ) Resets screen scale to the default setting. Ctrl + Shift + Refresh/F3 Rotates your screen 90 degrees. The Refresh key is located where the F3 key would be located on typical keyboards. Ctrl + Immersive Mode/F4 Configures display settings when an external monitor is connected. The Immersive Mode key is located where the F4 key would be located on typical keyboards. Use Three Fingers across trackpad to scrub through each tab you have open in your Chrome Browser. Ctrl + T will open a new tab. Ctrl + Shift + T will open your most recent closed tab. Ctrl + N will open a new window. Ctrl + E or Ctrl + F will open up your Chrome browser settings. Ctrl + Shift + B Toggles bookmarks bar from view. Ctrl + Tab will switch your tabs (cycles left to right). Shift + Tab will switch your browser window. Alt + Left Arrow will take you back a page in your history. Alt + Right Arrow will take you forward if you’ve already navigated back. Press Ctrl + Click on a link to open it in a new tab. Press Shift + Click on a link to open it in a new window. Alt + Up will move the page up (as opposed to scrolling). Alt + Down will move the page down (as opposed to scrolling). Ctrl + D will save current page into bookmarks. 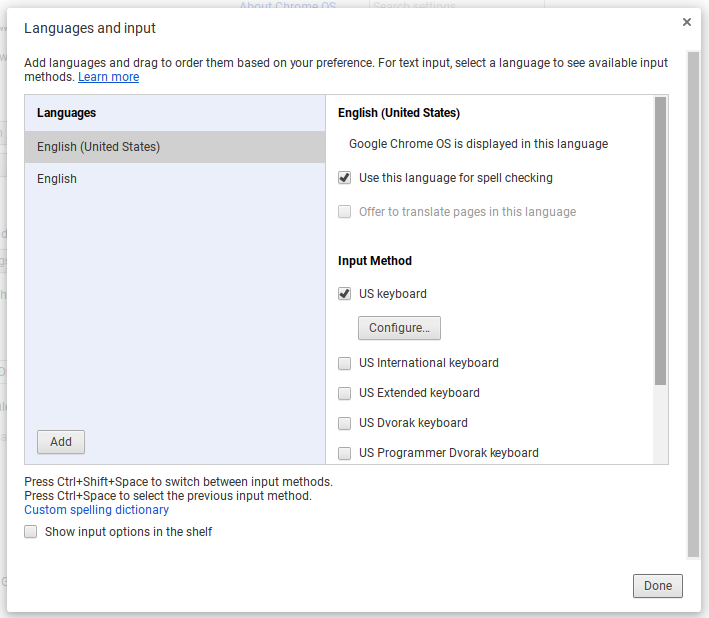 Chrome OS also supports standard text-editing keyboard shortcuts other operating systems support. For example, you can press Ctrl+Backspace to delete the previous word, use Ctrl + Z to undo, and use the standard Ctrl+X, Ctrl+C, and Ctrl+V shortcuts to Cut, Copy and Paste. Use Ctrl + Alt + / to see EVERY keyboard shortcut, which adapts to whatever application you have open.